The first thing that hits you about Kauai is the island’s lush natural beauty. 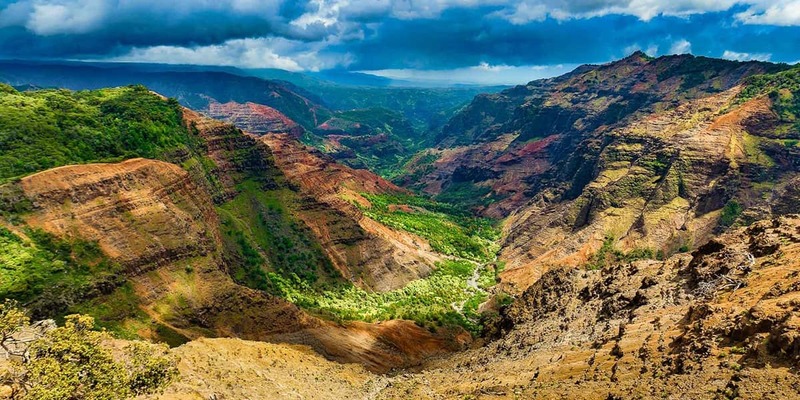 Covered by tropical rainforest that include the dramatic sea cliffs of the Na Pali Coastline, Kauai is also home to the Waimea Canyon, referred to as the Grand Canyon of the Pacific, which is 14 miles long, 1 mile wide and 3,600 feet deep. Mt. Waialeale, the wettest spot in the United States, has an annual rainfall fo 452 inches, keeping the reservoirs and rivers full and the island a luscious green. Welcome, to the “Garden Isle” of Kauai, the oldest, smallest and most tropical of the four main Hawaiian Islands. The island of Kauai is the smallest of the main Hawaiian Islands and the oldest. This means that the volcanoes that formed Kauai (and all the Hawaiian Islands) have had the longest amount of time to be eroded by wind and rain. The dominant geological features of the island are massive canyons and thousand plus foot high sea cliffs. Couple this with over 50 miles of beaches (more than any other island) and the only navigable freshwater river in the state and it becomes obvious that this is a unique and special place. Since 90 percent of Kauai is inaccessible by roads, hiking and helicopter tours are a great way to see the steep forested landscapes of the “Garden Isle”. 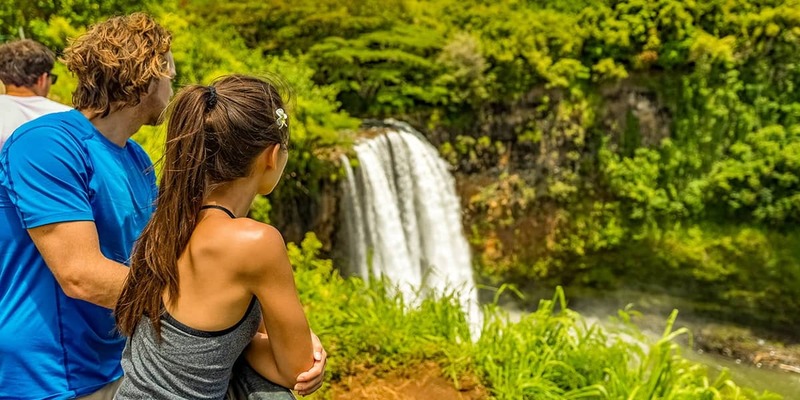 The Wailua River has river boat and kayak tours to the famous “fern grotto” and the river is home to an ancient Hawaiian village situated along its banks, giving rise to the sacred nature of this amazing river valley. The views on Kauai are just as spectacular from a boat tour, especially the 2000 ft high cliffs of the Na Pali coast. Kayaking, snorkeling and surfing are also popular activities along with ziplining, tubing through the old sugarcane irrigation ditches and exploring Waimea Canyon. Kauai has also been the setting of numerous movies and TV shows over the years and many visitors enjoy guided tours to famous locations for movies such as Six Days Seven Nights, The Amazing Race, Pirates of the Caribbean, Gilligan’s Island, Fantasy Island and Blue Hawaii! This lush and varied landscape has countless trails that bring visitors up close to flora and fauna of this unique island that is home to some 80 different species of birds that nest here, including 21 of them exclusively native to Kauai! Kauai is a lush green tropical paradise that is easy to experience in a short time because of it’s small size, making it the perfect island to venture to for a few days from another island. We can help you make the most of your Hawaii vacation by providing flights and rental cars to this beautiful island for the day while having your tours ready to pick you up upon arrival. It’s island hopping at it’s best! Did you really want to see Pearl Harbor from Kauai? There are a number of great tours to not only see Pearl Harbor but the rest of Oahu too. No vacation to Oahu is complete without a visit to the USS Arizona Memorial and the USS Battleship Missouri. After that, you can visit the historic city of Honolulu before getting back to Kauai for a late dinner. Approximate tour time is 7:00 AM to 8:00 PM. We recommend checking in an hour and 15 minutes before your flight’s departure arrive so please allow yourself enough time to do so. Our flights from Kauai to Oahu leave early in the morning and return later at night to give you more time in Honolulu so seats are limited. With that in mind, we recommend that you book this our Pearl Harbor tours before you arrive in Kauai. Details about your flights and airline confirmation codes will be listed on your itinerary. Transportation to and from Lihue airport is not included in this tour. Poipu is approximately 15 miles. Leave your hotel 2 hours before flight departure. Princeville is approximately 30 miles. Leave your hotel 2 hours and 15 minutes before flight departure. All Pearl Harbor Tours from Kauai include round trip airline ticket, 35-minute flight to Oahu and pick up at the Honolulu International Airport. All tours come with a tour/driver except for the Pearl Harbor Tickets – Kauai to Oahu Fly-Drive Package. What is the best area to stay in Kauai? Kauai has three main geological areas to stay. They include the lush north shore areas of Hanalei and Princeville, The east shore areas of Kapaa and Lihue (including the airport) and the sunny south shore areas of Koloa, Poipu, and Waimea. Which side of Kauai has the best weather? Kauai’s Mt Waialeale is the second wettest place on earth with 460 inches of rainfall per year. However just 20 or so miles away on the south side of the island, which includes Poipu and Waimea, averages around 35 inches of rain per year making it a popular side for visitors to stay. Kapaa and Lihue come in second with around 48 inches per year. What is the rainy season in Kauai? Rain can happen year around in Kauai but there are technically two seasons in Hawaii. Summer is the dry season and the rainy season runs from November to April. Do you need a car in Kauai? It is recommended that visitors rent a car while on Kauai. There is public transportation between towns but they do not allow luggage. Many resorts have shuttle service from the airport and the Hyatt Resort in Poipu offers green cars that can be rented by the hour. Many tours offer transportation from the major resort areas also. What is the best month to go to Kauai? The best time to visit Kauai is between September and November or from April to June. These are the shoulder seasons when the weather is pleasant and hotel and airfare rates drop. Are you staying on Oahu or one of the other islands and really want to see and experience Kauai? There are opportunities for you to do that no matter where in Hawaii you are staying. Take a day tour and experience the best of Kauai.